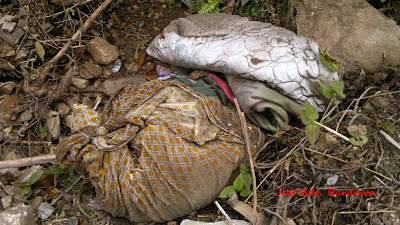 The earthquake of 18th September 2011 has given a rigorous and an unforgettable pain to every Sikkimese. It was a huge shake which not only devastated “Abode of God” but, also defaced the natural beauty of the tiny Himalayan State of the Indian Union. A diminutive amount was collected by the teachers and students of Namchi Govt. College to provide relief materials among the earthquake victims’ in North Sikkim. The main objective of the team was to meet the earthquake sufferers and to make them feel that “we are also not distant” as well as to share commiseration. 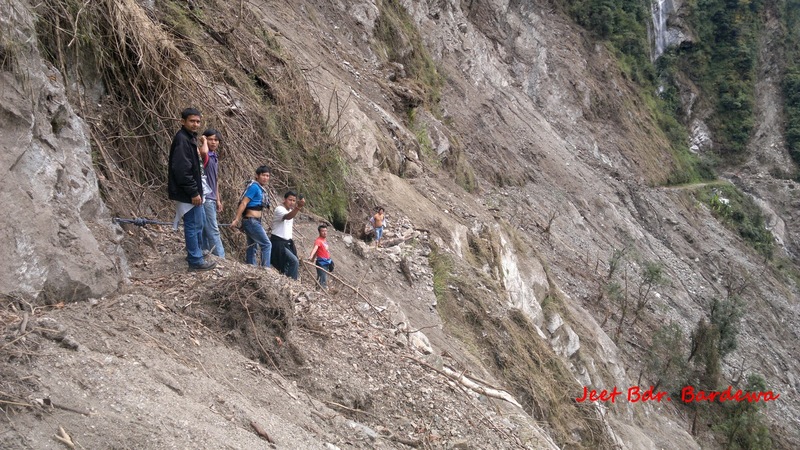 Before leaving there, the team members have gathered information about the existing situation of the affected areas and reached to a conclusion to visit Bey, a far flung village in North Sikkim. On 7th of October after receiving Tika from our elders on the propitious festival of Dasain, we began to proceed towards Mangan, the district headquarters of North Sikkim. 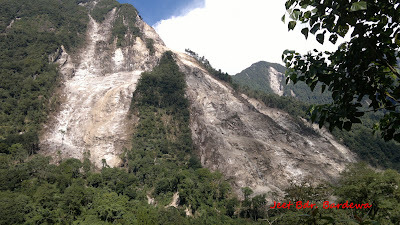 After some formalities we moved towards Lingzya, the last vehicle accessible village of that part (though Bey is also connected by road but due to heavy landslides after the earthquake it is totally cut-off from the mainland). It was almost 6:30 in the evening therefore we decided to stay at the Panchayat Bhavan which was turned as a relief camp after the earthquake. We met the Panchayat of Lingzya who made necessary arrangements for us to stay in the village. The Panchayat informed us about the fatalities met by his village and his village men. We tried to meet the people in the relief camp but, Mr. Bhutia the Panchayat told us that most of the earthquake victims have started to return to their own houses. It is a beautiful village mostly inhabited by the Lepchas very few Bhutias and the Nepalese who are mostly agriculture laborers from Nepal. On 8th of October, before we left for Bey, few villagers told us about two shocks occurred in the morning. They further told us that the shocks now have become usual elements in their lives. Yaha ta sano sano bhuichalo aai bascha….aba ta hamilai daar lagnu chodeko cha (here small shocks occur usually…now we do not get scare). There were more or less 80 bags which were to be distributed to the victims of Bey. 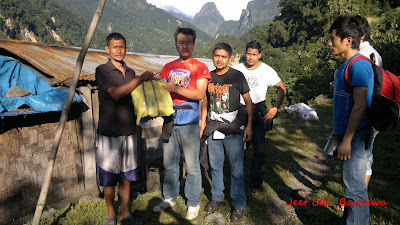 We decided to carry few bags as we were told that almost all the families of Bey were rehabilitated at 4th Mile. After having tea, we began to move towards Bey, one of the worse hit areas of Sikkim. We were carrying relief materials that included dry edibles and materials of daily use like candle, soap, cooking oil, toothpaste, toothbrush etc. Due to heavy landslide after the earthquake, the road connecting Bey with the mainland is now totally devastated. It is now all covered by silt, rocks and clay. 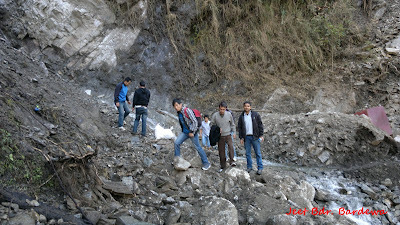 We reached 10th Mile where we could witness the real destruction of the earthquake. The entire road (approx. 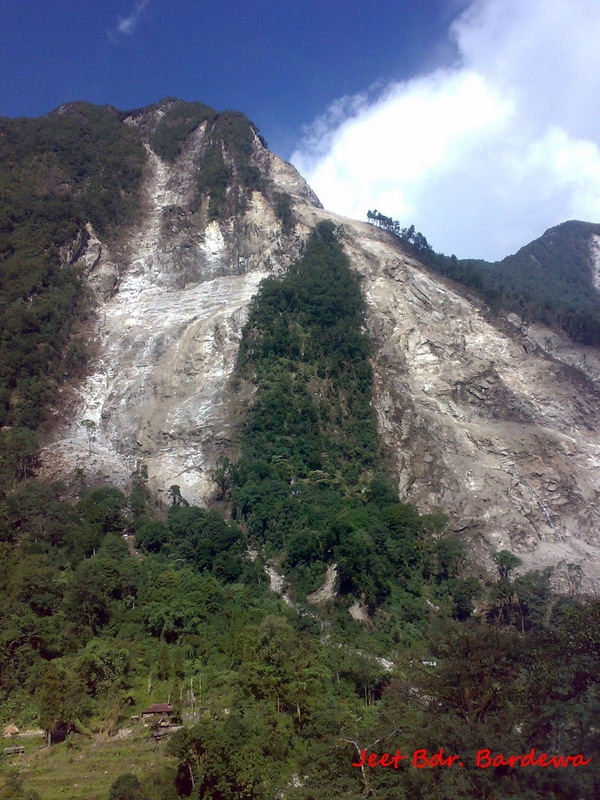 400 mts) is washed away by the avalanche and it is now covered by huge rocks and sludge. More or less, all of the mountains in that part of North Sikkim had attrition and abrasion. 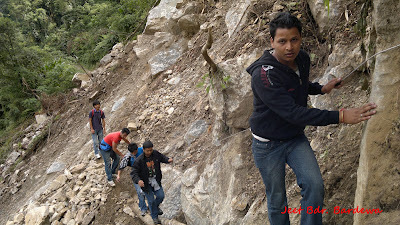 After crossing nearly fourteen landslides and the perilous way (where we had to cross the gaps by walking on undersized logs and sometimes by holding ropes tighten there by the mountaineering team) our team reaches Bey at 8:30 A.M. There were very few villagers who had come there to lift Dhaja in the name of the deceased from 4th Mile relief camp. We distributed the relief materials to the villagers and shared our grief to the surviving members of the deceased. 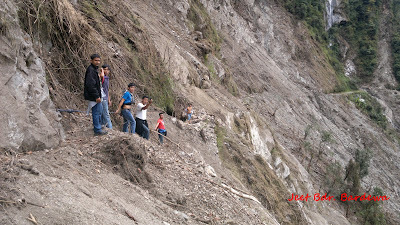 The villagers notify us that the village used to have 16 houses of which 4 were sweep away by the landslide. It has to be mentioned here that this village is situated below a mountain which was fall down after the earthquake leading to the death of five people of a lone family. The misfortune of those people who lost their lives is excruciating. After the wobble, the villagers were rescued by the teams led by the locals and NDRF personals. Apart from the human lives, the village has lost almost every means of its survival. It has lost its agricultural lands, livestock, houses, orchards, cardamom lands and so on. According to a woman she has lost all of her livestock in the catastrophe. She had twenty cows, few pigs and goats which were brush off by the landslide. 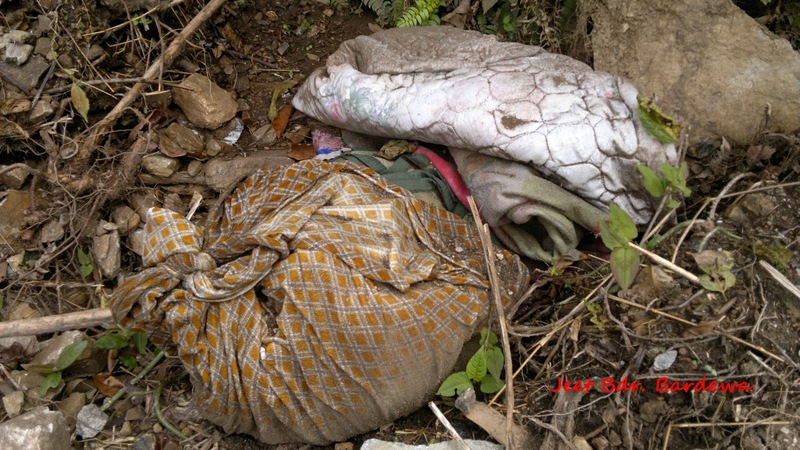 We have also observed homely materials like frying pan, and small packs of cloth scattered around the village which were thrown by the villagers in distress. The domestic animals, which had overcome the fatality, were grazing in the plains of the derelict village. The picture of present Bey is a heartbreaking one. Within a fraction of second the beautiful village of Bey was converted into a land of misery. The Lepchas of Bey and their virtuousness, their openhandedness and their simplicity on the one side and the loss of their near and dear ones along with their property on the other has greatly shaken my idea of the existence of a “Supernatural Power” which we generally term as GOD. 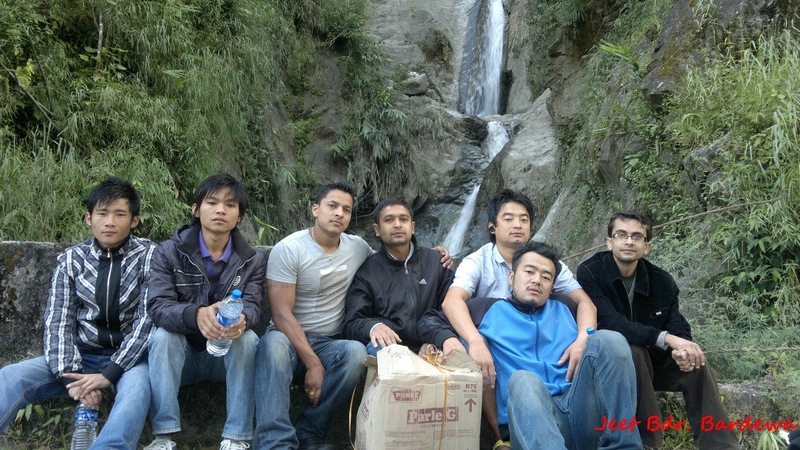 The team of Namchi Government College was lead by Mr. Rajen Upadhyay, Assistant Professor Department of History and was convoy by Mr. Dweep Subba (V Semester) Mr. Jeet Bardewa (V Semester) Mr. Tilak Bardewa (Pass out Student), Mr. Hari Chandra Sharma (V Semester), Mr. Phurba Lepcha (III Semester), Mr. Santosh Rai (III Semester) and Mr. Simon Rai (Driver). Being a team Leader I would like to thank Mr. Simon Rai who has carried the entire relief materials on his shoulders on the adverse way towards Bey.